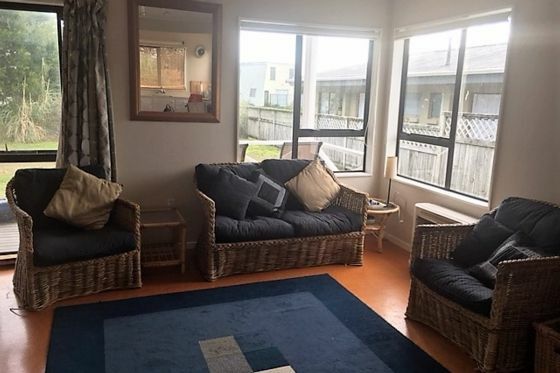 This is a very affordable and comfortable little beach house on a full flat section and within walking distance (about 700m) of the ocean beach. Tucked behind some rather overgrown vegatation alongside the road (but providing plenty of privacy), the little house is a pleasant surpise. To be perfectly honest, the furnishings are a bit of a throw back to the 90s but the place is fully furnished and everything is clean and tidy, The interior is fresh and has been painted in the past 5 years. The section is great for playing ball games. If you want a day away from the beach, there is plenty of space. This has been a family beach house for many years - babies to little children and now teenagers - and has been a terrific little getaway for every stage. It is only about a 10-15 minutes walk to the beach (depending on how fast you want to go). The surf club is only a 2 minute drive away and the shops a further 2-3 minutes - but everything is close by in Whangamata! Thanks for letting out your batch. We had a great stay. Perfect location and place for our family. As advertised basic but comfortable with everything we needed. Great beach bach in great location. Thanks Annabel. Perfect bach for the three of us, classic as.